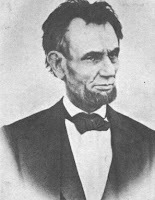 A couple of months ago, I posted an entry about a poem written by Pulitzer Prize winner Paul Horgan about Abraham Lincoln, from his book Songs After Lincoln. Today, I feature another selection from this book, this one from pages 63 and 64, entitled "The Last Photograph, April 9, 1865." Life seemed a stale surrise. Was worthy of its cost. Very enjoyable blog. Well done!